I’m not a kitchen gadget guy. I’ve never been a kitchen gadget guy. But every birthday and Christmas I invariably receive astoundingly useless gifts. There was the bagel slicer; the vacuum sealer (I actually used that one for a while); the spoons that measure a smidge, hint, pinch, and drip; and the mechanical tea-bag squeezer. All are tag-sale fodder. I prefer to use a knife to cut my bagels, tightly wrap food with plastic, pinch my own spices, and squeeze my own tea bags, thank you very much. So it’s not surprising that I looked upon thefoodloop with utter skepticism. 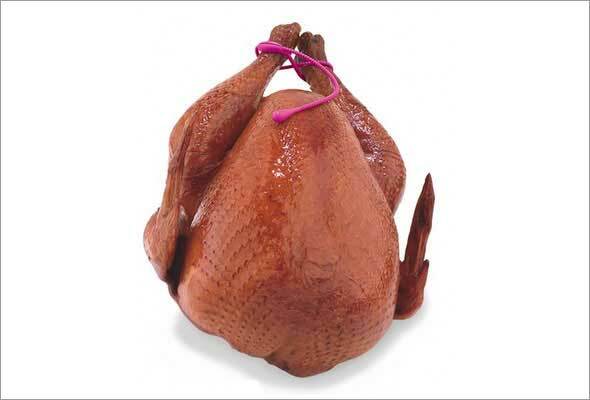 A ribbed silicon tie that takes the place of twine? But the notion of rolling, binding, or trussing food, such as a turkey, stuffed pork loin, or a boneless leg of lamb, with just a snap intrigued me. I tried one on a roast chicken (as a test for T-Day), and it held perfectly. They’re also heat resistant up to 675 degrees in the oven, microwave, or on the stovetop, which means I can even burn dinner, and it’ll still hold together beautifully. Best of all, the loops are reusable; just wash them in hot soapy water. I loooove my vacuum sealer. I tend to overbuy, and stuff like ham is totally destroyed by freezing, then thawing. Ta da! Enter the vacuum sealer. I seal things in reasonably large portions — company dinner size — and leave them in the fridge. Not more ham jettisoning quarts of water, turning salty and stringy. I know if I would just learn a little purchase control I wouldn’t have this problem, but I can’t resist a bargain! Ruthie, how did you know this was at the top of my must-have list? So glad to hear that my longings are justified. Any advice before I go shopping? Okay, I’m sold! I’ve been coveting one for so long, I think it’s time to make the purchase. I see a lot of pastrami sandwiches in your future, um, let us know if you have a party- you might find us on your doorstep!